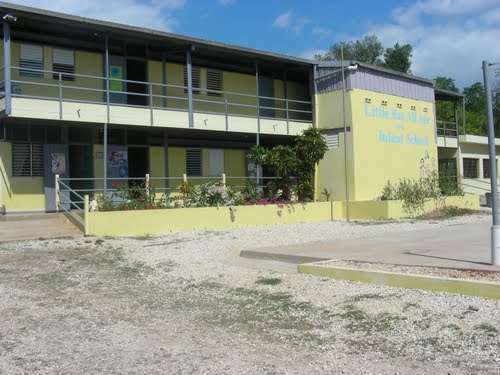 Scores of parents turned up at the Little Bay All Age and Infant School in Westmoreland to protest calls for the removal of the school’s Principal. Principal, Keron King’s being investigated by the Education Ministry following claims by the Board’s Chairman of financial mismanagement at the school. It’s understood there’s been a breakdown in the working relationship between the principal and the school’s board. Last week, the school board decided to cease all working relationship with the principal. Chairman of the board, Cliff Reynolds, told our news centre they’re asking for the Ministry to remove King as the school’s Principal. But President of the Parent’s Teacher’s Association, PTA, Mrs Kaydia Ellis Johnson says the parents think otherwise. She also says parents are refuting claims that the Principal couldn’t account for over 2 million dollars from the school’s canteen and tuck shop. Kaydia Ellis Johnson, PTA President at the Little Bay All Age and Infant school. She was speaking recently with Nationwide News. Mrs Johnson says they’re to meet with a representative from the Ministry of Education later today to discuss the matter.